I neglected to write a “planning” post this week – whoops! I actually DID plan out our meals, too…though with only a couple of nights of cooking needed (we are headed to MIAMI! this weekend), I took a bit of the easy way out. We did a lot of recycling and reusing chez nous, and we’re still dining on leftovers. 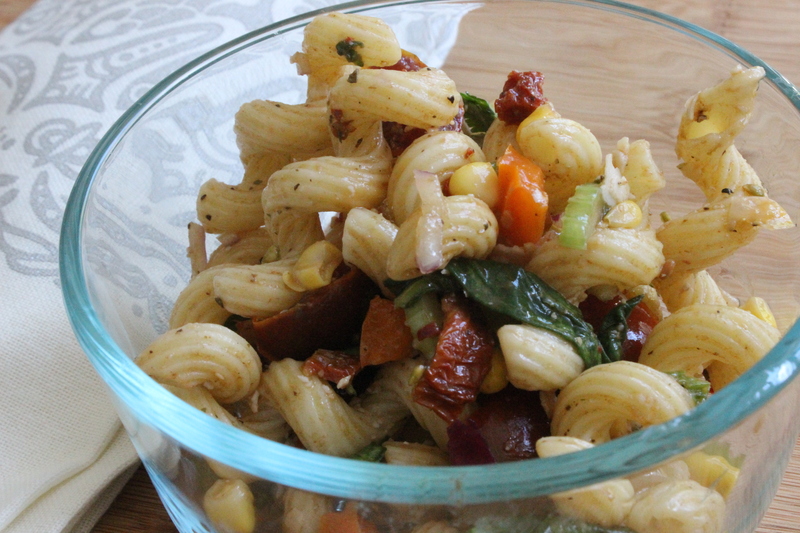 For example, this pasta salad, which I made to bring to a friend’s impromptu BBQ on Sunday evening (another reason to love spring: impromptu BBQs). This “recipe” is an absolute go-to. I remember making it for the first time with my mom probably ten years ago, and it’s become a staple at the yearly beachside bonfire we host with a bunch of family friends. Of course, the first time she made this, my mom was just using up vegetables she had in her fridge – I don’t get my propensity to throw things together and call it dinner from nowhere, you see. There are, however, two secrets to elevating this from grocery store pasta salad to the kind of pasta salad to end all other pasta salads. See if you can spot them. Boil water for pasta; while you’re waiting, prepare/wash/chop all of your veggies, and place in a LARGE bowl, EXCEPT for your sundried tomatoes. Cook pasta according to directions. While the pasta is still warm, toss with the veggies – and then add your sundried tomatoes and a bit of the oil it comes in. Give it a thorough toss. Whisk together your dressing and add to your pasta. Finish off your salad with Parmesan and a generous dose of herbs. Serve warm or chilled – it won’t last long either way. This one’s a go-to for good reason. I made an extra large batch on Sunday, taking most of it to the BBQ and leaving a bit behind for me and the Husband. By Monday evening, I had (very generously) left him two (full!) strands of Cavatappi. I am such a great partner, sometimes. PS: You can obviously add olives to add brininess, and whatever else your little heart desires. I have and enforce a strict no-olive policy chez nous. 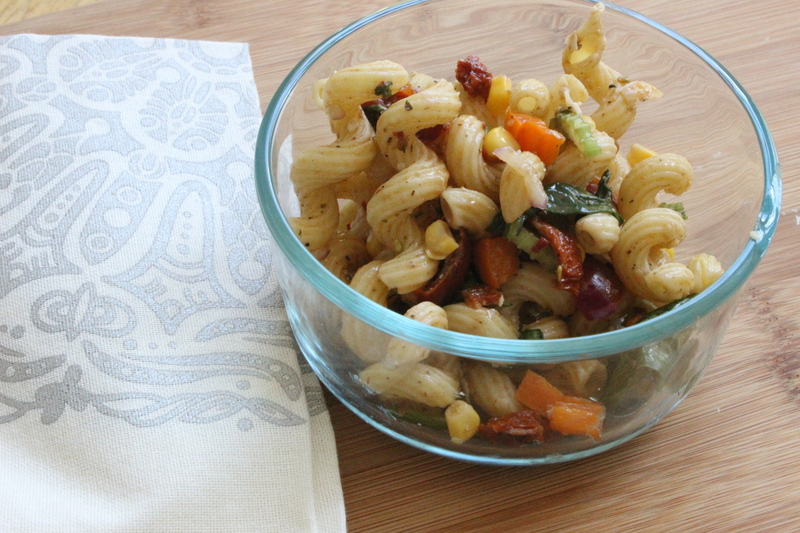 Posted on April 22, 2015 Author varinajCategories go-to, pasta, vegetarianTags balsamic vinegar, bell pepper, celery, cilantro, corn, go-to, onion, parmesan, spinach, tomatoes6 Comments on The Only Pasta Salad Recipe You’ll Ever Need.